Some friends recently threw a Saturday morning "Ultimate Frisbee and Breakfast" gathering. I signed up to bring muffins but then figured 20 other people would bring muffins too and there is always a lack of sustenance at those events. When I saw someone else sign up for sausage (and I sighed a big sigh of relief/hunger) I decided to bring something heartier too. The problem was I decided this the night before around 10pm for the breakfast that started at 8 am the next morning. 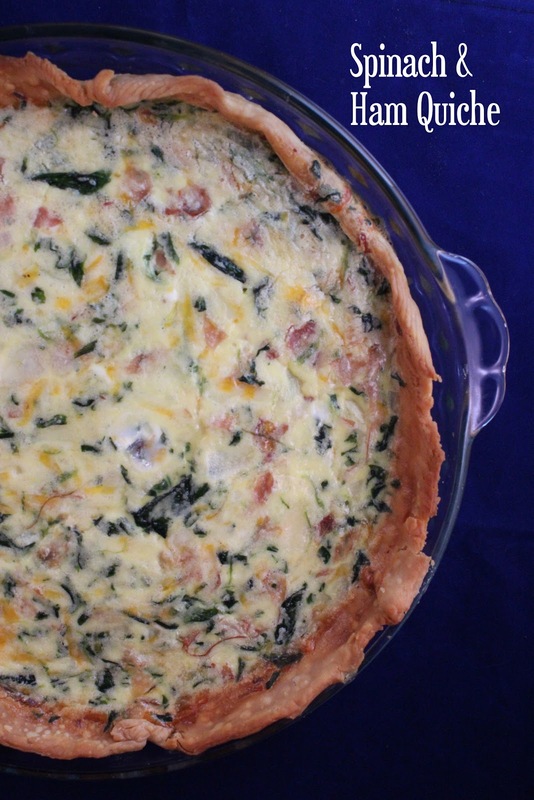 Enter my brilliant idea for quiche! I keep frozen pie crusts on hand as well as frozen spinach, fresh cheese, sliced ham, onions and milk. I did luck out that I already had some heavy cream and sour cream on hand so voila, the ingredients for a yummy quiche. Quiche is another great meal where I feel like you could totally change ingredients around, like using a stronger cheese like Gruyere or using ham instead of bacon or both! Or leave out the meat if you prefer (just make sure to supplement the salt if you do that). Don't like spinach? Leave it out. This would be a great meal for Easter brunch served with fruit and muffins or french toast! Line a 9 inch pie pan with the pie crust but then cover with 2 layers of foil. This will help keep the crust light and flaky. I also used a pie shield to cover the edges or use more foil to prevent burning. Bake the crust for 8 minutes at 450 degrees. Remove the double lining of foil and bake for an additional 4 to 5 minutes or until crust is dry. Remove from oven. While crust is baking, cook onion and ham or bacon in a skillet. I just wanted my ham to get a slight crisp but you will definitely want bacon crispy and the onions tender. In a medium bowl, stir together eggs, sour cream, heavy cream, salt, and pepper. Add in ham and onion mixture along with spinach and cheeses. Pour egg mixture into hot crust. Cover edges of crust with foil or pie shield and remove 10 to 15 minutes before quiche is done. Bake for 45 minutes-1 hour or until knife comes out clean. Serve hot or warm for best taste.